Tara or Arya Tara, also known as Jetsun D lma in Tibetan Buddhism, is a female Bodhisattva in Mahayana Buddhism who appears as a female Buddha in Vajrayana Buddhism. She is known as the "mother of liberation", and represents the virtues of success in work and achievements. Crown Tara is a tantric meditation deity whose practice is used by practitioners of the Tibetan branch of Vajrayana Buddhism to develop certain inner qualities and understand outer, inner and secret teachings about compassion and emptiness. Tara is actually the generic name for a set of Buddhas or bodhisattvas of similar aspect. 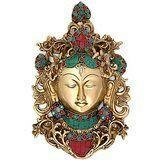 Crown Tara Buddha Devi Wall Hanging Mask Sculpture Metal Brass Turquoise art. Size : 11 Inches Height X 7 Inches wide X 2 Inches depth, Weight : 2 Kg, Material : Brass, Features:- Made from Quality Brass and Handmade in India. -------------- Pls beware from Copy product & ensure buying authentic product. This is exclusive product of Brand " Collectible India" and "covered by intellectual property rights laws". 'Collectible India' do not authorize any other Brand/Seller to sell it and won't be responsible if any copy or substandard product send by any other seller.